Sasuke found himself face to face with the leader of the village he once called home. Now, the Uchiha was back and ready to fight this old man. Despite the fact that this man was probably beyond the age of 100, Sasuke was smart enough to know if he underestimated him, he would surely die. He wasn't Hokage for nothing. Things were as fair as they could get, because all the 3rd knew about Sasuke was that he was a member of the Uchiha clan, so he could not really know anything of his abilities. The self-proclaimed "Avenger" placed a hand on the handle of his sheathed katana, and closed his eyes. "Listen, old man... I'm not going to hold back on you because of your age. Prepare to face the power of a true Sharigan user..." Sasuke said, and suddenly opened his eyes, revealing the crimson circles with three black commas each. Had this old man not been so experienced, this action alone might have caused his limbs to freeze up with fear due to Sasuke's killer intent. Standing ontop of the Chunnin Exam stadium was the 3rd Hokage of Konohagkure no Sato already dressed within his battle uniform. His rinkled face looked right into the evil eyes of the little kid who he had lost conatact of. The 3rd Hokage sighed while noding his head. The kid had now activated his Sharingan but it was something the old man had already seen but not in a very very long time. "You have changed much since I last saw you Uchiha Sasuke. But you must remember boy, that I have experienced much more then you have in your life time and faced the strongest of enemies. So now that I know your not going to hold back on me, then today you fight a real Hokage." After saying these words, the old man would instantly get down into his battle stance ready to fight the little kid who had most probably mastered the use of his Sharingan after such a time span. His entire physical apearance and changed, and he seemed more calm and confident now. Unlike when he was a child and lived with anger only seeking revenge. Mabe he had fufilled his destiny and actualy killed Uchiha Itachi. It was something the old man would have to take into acount and make sure he never gave the former Konoha nin any chances. Sasuke had grown tired of the chit-chat, and fast. The stare down continued for a short moment. His grip suddenly tightened on the handle of his blade, and his eyes shot wide open. The 3rd would probably be stunned when he found himself starring right into Sasuke's sharingan, which was so far just the blink of an eye ago. Not only that, but Sasuke's katana was running right through his throat, and out the back of his neck. As his own blood gushed out everywhere, Sasuke whispered, "See.. this is the difference in our power," and then, he finished his sentence in a voice loud enough to hear from a distance, "old man." The moment his voice had grown louder, he instantly vanished from in front of the Hokage, and was back in the exact same spot that he had started. Not only that, but the wound in the Hokage's throat was completely gone, along with every single drop of blood. A Genjutsu. This illusion had hopefully shaken up the 3rd enough for him to react too late for Sasuke's next move. Using his superb mastery of shunshin, Sasuke appeared in the air over the old man, swinging his sword down diagonally. If it connected, it would slice right through his left shoulder/neck, and come out of his right hip. Trying to block it would prove futile, due to the fact that Sasuke had charged a Chidori into the sword's blade, impossible to notice during this kind of high speed attack. If the attack was successful, the Uchiha would then land with his eyes closed as the 3rd's blood exploded out in every direction, and his body slid apart in two, perfectly cut segments. After the 3rd Hokage had finished speaking to the Uchiha who stood before him, suddenly Sasuke had vanished and apeared infront of the old man with his blade already slicing through his throat. Blood gushed out of the Hokage's flesh like a fountain. But the feeling of death vanished as Sasuke once again stood before the Hogake and there was no wound on the old mans neck. "A Genjutsu!? He would think to himself. But Sasuke had vanished once more and was now mid air before the Hokage holding his katana. Using his swift speed, the Hokage would slightly duck and slid to the left side barly escaping Sasuke's attack. The katana had slashed the Hokage's right should creating a large cut down his upper right arm and shoulder. The minutes the sharp katana skinned the Hokage's shoulder a massive shocking sensation ran through his body almost paralyzing him. But using all of his strength to continue off to the side, he would whipe the blood off of his shoulder with his left thumb he thought to himself "Sasuke has grown relentless and wont hesitate to kill me. So I cant hold back on him even if he once was a Konoha nin." Performing swift seals in the blink of an eye, the Hokage smashed his palm onto the tiled rooftop. Black markins spread out from his hand as a tiny explossion of smoke errupted around the Hokage. A second later an extending long and large staff came explodding out of the smoke with magnificent speed heading strait for Sasuke's face. There was little smoke so it vanished within seconds of Enma having been summoned. Sasuke's attack had missed, but not completely; he had still managed to cut the Hokage's right arm fairly deep. Had it been a stab, the 3rd would have been paralysed long enough for Sasuke to finish him. When the Uchiha landed on his feet, the old man had got back up and reached into his wound with his left hand to get some of his own blood onto it. After training with Orochimaru in the arts of summoning, and being able to see what the Hokage was doing before he actually did it thanks to his sharingan, there was no way he would allow this old fool to bring a stronger creature into this plane. Sasuke thrust his free hand forward, pointing his index and middle finger down at the 3rd's feet. A dark green viper slithered out from his forearm sleeve and suddenly shot through the air with frightning speed. As the Hokage's hand went down to slam the tiled roof, the viper wrapped around his wrist and held his entire arm in place as it hissed. "I don't think so..." Sasuke said calmly as he pulled back on the snake like a rope, also lifting the hokage right off his feet. The snake suddenly began retracting back into Sasuke sleeve, so at the same time it would pull the old man towards him at a high speed. Sasuke then spun his katana in his hand, then grabbed so it was upside down, and went to hit the 3rd with a fatal stab, chidori once again charged into the shiny metal blade. The Hokages hand was just about to touch the tiled roof top when suddenly a snake wrapped arouns his wrist preventing his arm from going any further. Looking up at Sasuke with anger as the snake curled around his wrist, Sasuke spoke to the Hokage and then pulled back on the snake. But to Sasuke's surprise the Hokage wouldnt move from where he was standing. Having added chakra into the soles of his feet, the wise old man remained where he stood. Thrusting his right arm forward, suddenly a tag attached to the body of the snake that wrapped itself around the old man. A tiny fire was already spreading across the tag when it suddenly exploded. The explossion had completely blown up the snake to shreds. The rooftop slightl shook do to the exploding tag as a cloud of smoke formed before the Hokage. Putting his hands to gether, the Hokage performed several seals within simple seconds. The Hokage's chest was now expanding, building up a massive amount of chakra within his lungs. Thrusting his upper body forward the chakra would release itself from the Hokage's mouth and with swift speed dart towards Uchiha Sasuke. As the deadly flames smashed onto the tiled rooftop and spread forward, the tiles would explode and melt do to the intense heat of the jutsu. As the Hokage blew the fire jutsu forward, by adding more chakra into his destructive justu, the fire wave would grow much larger and more deadlier as it slid across the tiled rooftop heading strait for his opponent. Sasuke could see clear as day that the Hokage was concentrating chakra into his feet, so it didn't surprise him when the old man stayed in place despite the powerful tug. Next thing the Uchiha knew, his snake was blow to shreds thanks to an exploding tag, but that was the least of his worries. Seeing the build up of chakra within the cloud of smoke, Sasuke could figure out what was coming. He swiftly stabbed his sword into the ground, and formed some seals of his own, at a speed that could match that of the Hokage's, if it wasn't already quicker. The next moment, a huge fire burst through the cloud and tore across the rooftop. Sasuke sucked in a bunch of air, and then blew it all back out. But instead of CO2 being blown out, fire came forth from the Uchiha's puckered lips. This massive amount of fire had the shape of a cross between a lion and dragon's head. It roared fiercly as it ripped through the air and smashed right into the Hokage's burning stream. A torrent of fire swirled into existence on impact, and grew to a frightning size. Sasuke brought up one arm to protect himself a little, and then brought it back down when the flames cleared. "Enough." 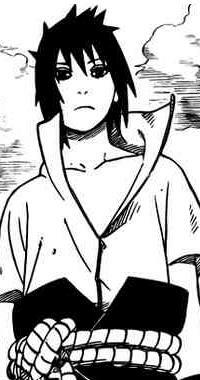 Sasuke said, already tired of these games. He removed both of his wrist bands, and touched onto the tattoos that he had placed upon his own flesh. These were no ordinary tattoos, they were sealing kanji that held items. Two large clouds of smoke erupted around his hands. The smoke suddenly burst away and disappeared as Sasuke vanished from sight, re-appearing upside down in the air high above the spot he was just standing in, and holding a fuuma shuriken in each hand. Spinning around while swinging his arms around, he roared with effort as he threw both huge shurikens at the old man. They spun so fast that they made a weird 'vroom' sound. Then something strange happened. One moved in front of the other in a way that would make it seem that the second one dissapeared from the Hokage's sight. By this time Sasuke would have landed, and waited, watching with his Sharingan to see what this 1000 year old man would do. Little did the 3rd know that Sasuke was actually controlling this shuriken with two metal wires so thin they appeared invisible. If the Hokage would try and dodge, Sasuke would just use a string to make the second shuriken follow him there before he actually went. If he somehow prevented that attack, Sasuke would use the other string to make the first shuriken come around from behind and slice him in half. He was in trouble now. As the Hokage's massive powerful fire jutsu swept across the tiles rooftop like wild fire spreading across a forest heading strait towards Uchiha Sasuke. But the kid used another fire jutsu creating a massive head of some sort of dragon/lion head. Smashing right into the Hokage's fire jutsu the two blasts of flames collided creating an explossion of light and fire. Squinting do to the after math of the two power jutsus, the Hokage kept his vision on Sasuke watching his every move as the wind whiped by hard. The old man would shift his vision up into the sky as the Uchiha apeared up high with his two Fumma Shurikens ready to be used. As they were launched forward, the old man swiftly performed a series of simple hand seals. Chakra filled his mouth as he watched the spinning tools of death apraoch. Spitting the chakra out of his mouth onto the ground as a river of mud, it suddenly errupted into the sky as a mountain of earth. Creating a massive wall of earth infront of the Hokage almost taking up the full width of the roof, the wall would block the two projectiles. The wall now covered the Sharingan from the Hokage. Swiftly performing another set of hand seals, the Hokage said "Its time I bring you forth." Slapping his bloody hand onto the earth wall before him Sarutobi said "Summoning Jutsu; Monkey King Enma!" An explossion of smoke errupted as the abornaly large monkey stood on his fours growling furiciously beside his master. "Uchiha Sasuke is our target so we must take him out together and swiftly." Enma noded as he exploded into smoke. The old man stuck his hand into the smoke and took hold of the staff which Enma transformed into. Remaining behind the wall that he created Sarutobi told his summoning "Now we must wait for his move." Keeping all sences on the high, and eyes opened looking for the Uchiha "If we make any move out from behind this wall, his Sharingan will catch us and then were dead." "I will tear this kid to shreds Sarutobi!!!." "Pacience Enma. He is not to be underestimated." As Sasuke guided the twin fuuma shuriken, he watched a shadow form some handseals before the Hokage actually formed them himself. Judging from the handseals made, Sasuke concluded that he was about to use an earth jutsu. Sadly for him, earth was weak vs lightning and sasuke knew this very well. He transmitted a chidori through each wire, causing the blades of the two shuriken to also be infused with the powerful lightning chakra. The next moment, the mountain of a wall came up from the mud he barfed up. Sasuke's twin fuuma shuriken dug into the rock and slid through like a hot knife through butter. The Hokage would proably hear them coming due to the loud grinding noise, but now Sasuke had already come up with a new move. He stabbed the two wires into the tiled floor by using two kunai. By this time, the chidori charged shuriken would have burst through the other side of the earth wall and right for the Hokage, one after the other. Sasuke swiftly formed some handseals, and the next second, a huge flame erupted around him. "Katon... Dragonfire no jutsu..." the Uchiha muttered. At that moment, all the fire raging around him shot forth, guided by the strings. It would strike the wall with a loud roar, burning right through, creating a large whole in the earth and blasting out the other side. Now sweating a bit, Sasuke would wait to see the result of his explosive fire attack. As the 3rd Hokage's mud wall shot up before him, the old man went to go perform his next justsu when suddenly the sound of something grinding against the front of the wall rumbled through the old mans ears. Sarutobi would swiftly duck down towards the ground getting as low as he could. Standing on his fours now, as the two fumma shurikens errupted past the wall right over the Hokage. Barly having dodged the massive shurikens, the Hokage's head was almost chopped right off of his shoulders. Right after having dodged the two Fumma Shuriken, the 3rd Hokage could hear the sound of flames swiftly growing louder untill they too smashed into the front of the earth wall. Sarutobi's eyes would open up wide as he realized what was coming towards him and after the earth wall took a hit from the first attack ut wouldnt within stand the incoming one. The fire roared as it came into contact with Sarutobi's earth wall. the 3rd Hokage swiftly pounced up into the air trying to dodge the incoming attack. If Sasuke's attack had come seconds later Sarutobi would have been able to dodge the incoming attack. but since it hadent, the fires bursted right through the earth wall peircing through the back and smashing right into the Hokage's lower body. Hitting him backwards, the old man would grunt in pain as he came smashing down onto the tiled rooftop. Lying down for a couple of seconds, the Hokage would look up and to his surprise the earth wall was falling apart and started to come tumbling down towards the surface of the roof. Small and large boulders decended towards the old man as he laid on the ground. Performing swift seals, Sarutobi slapped his bloody right hand onto the roof surface beside him. A tiyn explossion of smoke explode. Quiwly vanishing Monkey King Enma stood there on his fours, watching as a massive boulder came right down towards his master. Swiftly grabbing the Hokage, Enma would jump backwards right at the edge of the barrier as the entire wall came crashing down creating a massive cloud of smoke and rubble that covered almost the entire perimiter inside the barrier. The smoke would block the Uchiha's vision from the two of them "Get up Sarutobi!" The old man would grunt and slowly stood up back onto his two feet. His lower body was burnt and damaged but the old man had faced more then this and was able to handle it. "We must do this..... together Enma. I have a plan." As the smoke remained up in the air slowly slowly fading away it would soon finaly all vanish revealing all the boulders that stood as a tiny moutain of rocks. Standing ontop of this moutain of rocks was the 3rd Hokage with a large staff held in his right hand standing taller then its user. Looking at Sasuke with a very serious and angered looking face the 3rd Hokage said "This battle as gone on long enough child. Its time I end this..... Now!" Sarutobi would say as he swung the staff around a couple of times in both hand then got down into his battle stance. This old man seemed to be a very good talker, but when it came to walking the walk, he was paralysed face to the power of this Uchiha. Sasuke looked at the staff he was holding in his hand, and wondered if that's what he had summoned. At this point, it didn't really matter any more. "I..." Sasuke started and closed his eyes, "Agree." The moment he said that, his eyes opened up again, very slowly, revealing something new. His Mangekyou Sharingan, to be exact. Sasuke suddenly vanished and reappeared next to his katana, and plucked it from the tiled roof. Sasuke vanished again, reappearing about 20ft. away from the 3rd, and then he jumped forward, flying up with insane speed at the old man standing on his pile of rocks. As Sasuke flew, he readied his katana for a stab and infused the blade with a chidori, completely undetectable to the blind eye. As the 3rd Hokage stood ready to battle with the Uchiha before him, the old man saw that something had changed about Sasuke's eyes. But he stood two far from his opponent to see what had actualy happened. Watching Sasuke's every move as he moved towards his katana and picked it up. Waiting for Sasuke to make his move, Sarutobi watched as the child dashed forward getting ready to battle it out with each others weapons. As the Uchiha sprung forward, the old man pointed the end of his staf right at the incoming opponent. Mabe, to Sasuke's surprise the staff would suddenly launch forward towards's Sasuke's face with much greater speed then the Hokage had attacked with previously. As Sasuke flew through the air, he watched as the Hokage changed positions and aimed his weapon at Sasuke like a bazooka. The Uchiha slapped his hand onto the top of the Hokage's weapon when it blasted towards him, and then used that to flip right over it. 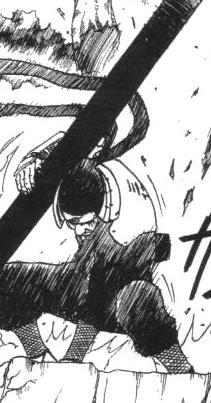 Performing a somersault, Sasuke landed onto the thick staff and ran across it straight to the wielder. Once he reached him, he crouched lower so the swing of his sword would cut the 3rd's head clean off his shoulders. As the tool Enma bolted forward, as expected with his Sharingan Sasuke had dodged the attack. Slapping his hand Enma and performing a summer sault over it. Sarutobi kept his stern looking expression as he watched Enma continue his attack on the Uchiha. The monkey king's arm would thrust out from the staff while the Uchiha was performing his summer sault so Sasuke would have no way of seeing it with his Sharingan. Enma's monsterous hand would latch onto Sasuke's hair instantly stopping him from continueing his arial manuver. Once the Hokage saw that his summoning had hold of his opponent, the old man swiftly swung his extended staff into the roof top. 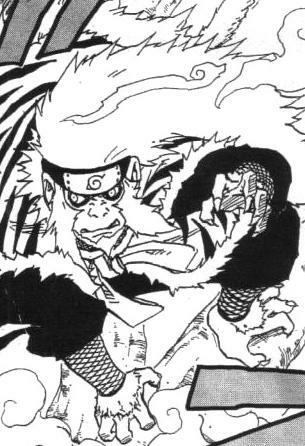 Plus with the added strength of the powerful monkey, Sasuke would smash into the rooftop with bone crushing force. Enma kept his arm emerging out of the staff keeping the weaker kid (muscle wise) pinned to the ground. And to make sure he didnt brake free, Enma's other harm emerged from the staff as well pining Sasuke down to the remains of the roof top. Sarutobi would continue his attack by jumping into the air not to high above the ground. Looking down at Sasuke at an angle, Sarutobi sent a speeding shuriken hurling over towards the pinned Uchiha. In the blink of an eye lighting fast seals were performed and suddenly the singal shuriken that headed towards Sasuke multiplied into 100 shadow shurikens all aiming for Sasuke's pinned frame. Sasuke's eyes opened a bit wider with surprise when the ape's hand flew out from the staff and grabbed onto his hair, a girl-like battle tactic. The next thing Sasuke knew, he was smashed into the ground, and being pinned down by two of those powerful arms. Without a word, Sasuke activated his chidori current, instantly coating his body with a layer of static electricity. Enma's entire body would be violently electricuted since he was in direct contact with the Uchiha. Sasuke got back up after pushing the paralysed staff over, and looked up into the air to see the Hokage throw a shuriken at him. Sasuke's grip tightened on his sword when he watched the shurikens multiply. This wouldn't be a problem. His arm started swinging and swriling around, cutting "through" each of the shurikens that would be a potential hit, causing the split pieces to hit the roof top and bounce away. He would continue these arm movements, making the blade of his sword appear as a flashing blur. Finally, there were no shurikens left, so Sasuke stabbed his sword into the ground and jumped forward towards the Hokage, full speed. On the way, he swiflty formed some handseals, and sucked in a lot of air. Blowing all this air back out in the form of fire, the Hokage would find himself faced with dozens of flaming spheres. Wherever the Hokage would dodge to, Sasuke would see it, and appear there, right in front of the 3rd. Their eyes would meet, and the Hokage would finally come face to face with Sasuke's Mangekyou. As the old man was suspended in the air he suddenly saw Enma get shocked by a wave of electricity. His shurikens continued forward but with ease the Uchiha had prevented them all. Alread having landed back onto the ground, the old man slightly shifted his vision to Enma keeping Sasuke in his sight and thought to himself "Sasuke must have paralyzed him. But for how long?" Without his summoning the 3rd Hokage didnt stand a chance. So there was only one thing left to do. As Sasuke dodged forward, suddenly two clones emerged from the Hokage, two Shadow clones. His fire jutsu sprang forward throwing dozens of fire balls towards the 3 Hokages. Two of them swiftly jumped off to the left one further from the other and the other one jumped off to the far right dodging all of the fire balls as they smashed into the barrier wall. Do to the chakra sorces within the Shadow clones and that the real 3rd Hokage's chakra sorce was low and grew smaller after performing such a jutsu Sasuke Sharingan would probably be able to pin point which Hokage was the real one. If he did and continued his attack on the real Hokage or didnt it would change anything. The three of them swiftly started performing seals. Each performing 3 seals exactly thet clapped their hands together. In the middle of the 3 shadow clones where they stood seconds ago a large floating demon would arrive onto the battle feild. But Sasuke would be unable to see this floating God of Death because only those who signed the contract were able to see it. The third Hokage shifted his eyes to the edge of their sockets as he locked gazes with the God. "So this is the Jutsu Yondaim Hokage tought me." The three of them looked at Sasuke ready to use their God on him. Enma slightly nudged his arm as he slowly regained feeling in his body wanting to go help his master. Sasuke watched as the 3rd created two shadow clones right before he fired the barrage of fireballs at him. Through his Mangekyou, he could see that they were about to perform some handseals, so Sasuke would take the opening to deal with one of his problems. He spun on his heels, swinging his arm and releasing his sword. It flew through the air like an arrow, and stabbed right through the twitching staff, pinning it to the ground. If Enma hadn't been killed by that, the Chidori charge in the sword was released through his system, hitting him with a violent shock and further paralysing him. Sasuke then looked over his shoulder to see that they had just finished their handseals, and that the Hokage was saying something about a technique taught to him by the 4th. "It's time to end this." Sasuke said coldly. The 3 hokages stood there all in the same stance with their hands clapped together. The real one said "Indeed it is." Swiftly performing several seals the other two hokages would move as fast as they possible could which was faster then most shinobi. One Hokage went to Sasuke right and the other went behind him. The Hokage beside Sasuke would throw his right fist forward and then his left fallowed by his left leg. While the Hokage in the beside attacked the real Hokage's jutsu took affect. More then half off the roof top turned into a massive ocean of mud. Trapping the two shadow clones and Sasuke within it. Now unable to move his feet the Hokage behind Sasuke grabbed his shoulders making sure he didnt go anywhere. Apearing before Sasuke would be the real Hokage. Having put chakra into the soles of his feet Asuma was able to stand ontop of the mud he had just created. Now that Sasuke was unable to move do to the mud bellow him. "time we end this." The old man said in a cracky weak voice. Suddenly out from the Hokage's chest would emerge the hand of a demon made soly of chakra. The chakra hand would plunge itself right into Sasuke's chest. Sasuke would feel as if he were dying already and it was simply the begining of the jutsu. Gripping Sasuke's soul from within, the hand would slowly start pulling Sasuke's sole right out of his body. Suddenly from the two other shadow clones a demon chakra hand would emerge from their chest as well and move right into the Uchiha's body. Tightly grabbing onto his sole, they too would start pulling it out of the Uchiha's body making the procces faster. Sasuke watched as the Hokage's clones went on the move. One of them came in on his right side while the other started running around him. That was proably the dumbest move he could make, and he was the 3rd Hokage. Sasuke thrusted his fist out, and it crushed the face of the Hokage while he was swinging his fist for the Uchiha. There was no way he could dodge this swift attack because thanks to his Sharingan, Sasuke had punched where he was going to be before he even got there. The clone would explode into a cloud of smoke, and the next thing Sasuke knew, the tiled floor beneath his feet had been transmuted into mud. He then felt the other shadow clone grab onto his shoulders from behind. Sasuke simply closed his eyes as he activated his chidori current, causing blue static eletricity to flicker all over his body. It wouldn't take long for the clone to explode, and for the earth around his feet to shatter since earth was weak against lightning. Sasuke then opened his eyes to see the real Hokage coming in at him, with chakra on his feet so he wouldn't get stuck in the mud. He finally made it to Sasuke, and by then the lightning around his body was gone. Sasuke looked into the Hokage's eyes when he said it was indeed time to end this. Out of nowhere, Sasuke suddenly felt a massive pain throughout his entire body, but concentrated on his gut. He looked down to see that there was some kind of alien arm pulling out his very soul. His entire body was paralysed, so all he could do was watch as the Hokage dragged out his soul with this third arm. "What... kind... of..." Sasuke muttered in pain, but couldn't finish his sentence because by then his entire soul had been pulled out. His eyes opened wide, and he fell over, crashing into the mud on his side. Then it happened. A huge metal cross burst up from the mud behind the 3rd. The next second, three katanas shot out from the hardened mud and at the old man. Two of them stabbed through his wrists, and pulled him straight up into the cross, pinning him there. The third sword would fly through both of his ankles at once, finishing off the pin. This nightmare wasn't over, though. The Hokage would find that he was unable to seal Sasuke's soul which he still held right in front of him. The soul then leaned in, and wrapped both of it's hands around the old fart's throat, and began squeezing harder and harder. The Hokage would feel his eyes start to buldge and water, but despite the fact he had no more air, he would not pass out. Ever. He would stay in this crucified position, being suffocate endlessly, for 72 hours. 3 days later, the 3rd would find himself back in reality, on his fours in the mud. In reality, it had only been 3 seconds. Sasuke was now standing behind him, and the Uchiha raised his right hand, making it into a spearhead, and shot a Chidori sword right into the old man's back. "You're lucky I haven't fully mastered the powers of Tsukiyomi... otherwise you would already be dead." Sasuke said. "Thank me in hell." he concluded, opening his hand wide. The Chidori blade split and extended out from the Hokage's body in five seperate blades. One through each of his lungs, one through his stomach, another through his intestines, and the last through his liver. Blood would explode from his mouth as he would almost instantly die. The chidori blade faded as Sasuke lowered his arm and deactivated his Mangekyou. His entire body was sweating, and he was panting pretty hard. He gave one last look at the Hokage's mangled corpse with his black eyes, then turned and walked away as though nothing ever happened here.